Every blog starts with a single step. Whether you’re on a blog for technology, for food, for hotels, for travel agencies, selling a book, or narrating your photography journey, a blog always has its sweet and humble beginnings. Today, I’m going to share with you some cool stuff on how you can start a blog—a food blog, specifically—and where you’ll go to set up the right resources. A food blog starts with the right motivation, not simply because you want to blog and not simply because you wanted money while staying at home. Blogging requires a solid determination to keep you going even for the following years to come, and a sure interest or passion for you not to get bored and sick along the way. Unique or original. Distinct that people can easily identify it from other blog names without getting confused with another blog. Best represents you and your blog. If your blog is a formal one, then choose a formal title. Friendly? Talking about desserts and fondues? Brainstorm! Your domain name must not be confused also with other domain names out there. You don’t want something like ‘hot-cakes.com’ when somebody already uses ‘hotcakes.com.’ Same rule also goes with using numbers and even symbols. If you’re unsure, use your best friend Google or check for domain availability here. Once you’ve picked a domain, the next step is to register that domain name and purchase a web hosting account from a reliable company. You will need a web hosting account in order to make your site work and accessible to the public. Also, this will be your storage to upload your website files. One of the best web hosting companies I know is Bluehost, they provide unlimited domain hosting and space, unlimited bandwidth and e-mail accounts. Free domain and an included blog builder. Regularly $5.99 a month. You can use this link (click here) to get 50% OFF (you pay $3.49/month instead). Head to Bluehost.com and select your plan. You can start with the Starter plan if you'd like. Now fill up the form with your personal/business details. You can still change your package if you'd like. I’d recommend you to get their Domain Whois Privacy for $9.95 per year. It protects your personal information such as your name, address and phone numbers from being displayed to the public. Now BlueHost will ask you to create a password for your account. Your username and password will most likely be sent to your email. Now you have purchased a website! Let’s get to the next step: Setting up your website (Step #4). Now we're going to install a content management system on your site using the most popular and reliable platform, Wordpress. This will be your blogging platform - a system or environment wherein your food blog will rely. It is where you put your content on, do some editing, and even take control of your blog’s behavior and statistics, which is called Content Management System (CMS). Enter your login details to access your cPanel. Check "I have read the terms and conditions of the GPLv2" then click "Install Now". Now wait for the process to finish - it shouldn't take you more than 5 minutes! Click on the "View Processes link then click on the "View Credentials" link, which are located at the very top of your screen. 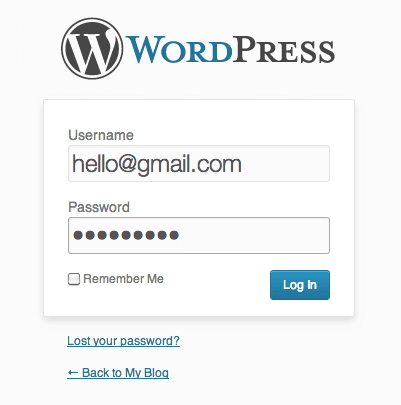 You may now login to your Wordpress CMS dashboard. Enter your details to login. Play around, experiment or research for quick tutorials to get the hang of it. You can also view your website to see how it’s look like! Here are some sites that can help you get started with Wordpress (trust me, it’s not as hard as you think). Your upcoming food blog should have a design that is as appetizing as the content you’re planning to post. Firstly, you must accept the fact that there are innumerable food blogs aside from yours, and this means that the competition is a strong key to consider. Don’t overdo the design. Blogging is about content, and keep it that way. You can start with a free or paid template, but as much as possible, strive for a unique one. Let the design do the ‘welcoming’ of the readers, hence the design itself should not be the main attraction. The design should only help readers direct their attention to what’s important. Create a consistent theme of colors. If you have an established brand before you start the blog, then use that brand’s color schemes and brand practices. Aim for original and beneficial content. Nothing makes a blog better than this. If you just aim for the money, or if you just aim for hitting the scores, then you’re not doing it right. Of course, they’re part of the overall blogging thing here, but still don’t sacrifice quality. Watch out for performance cues. Your analytics will help you with this. Which part or page or topic gathers the most audience? What do people love—and hate—about my food blog? Do they have any feedback or suggestions? Are they waiting for a feature or a topic to be posted? Installing Google Analytics to your site will definitely help you determine what your visitors looking for the most. Respond to your groups or friends, even if they are your competitors. If you can reach them in some social networks, do so. Most of the bloggers spend more time responding to their audience than they do with writing. If you also think a reward system will help make them loyal, then think of a creative one. Learn, learn, learn. You don’t have to do all at once, and you can’t because the systems are constantly evolving. Learn as much as you can not only on the field you’re writing about but also on the platform you’re working on.